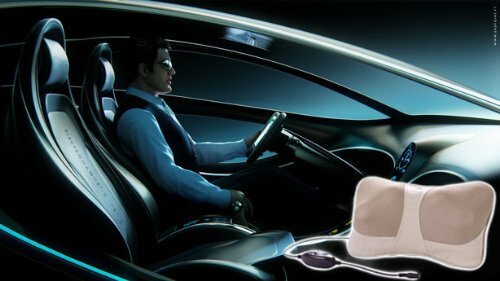 The Quality Life’s kneading massage car cushion has 4 rotating shiatsu heating heads. The soothing heat helps blood circulation. It targets muscle stiffness and tension where you need it; allows multiple massage positions for neck, lower & upper back, shoulders, lumbar area, abdomen, calf, and more. It weights only 3.5 pounds. This convenient, light-weighted pillow can be used in home, office and car. A free car adapter is included in the package. A stripe is built in the back of the car pillow. When it is overheated, the built-in Overheat Protection Device will turn off machine automatically. After a long day, sit down and relax your muscles with neck, back and shoulder massagers from The Quality LIfe. We have a full inventory of body massagers with heat therapy. This machine has 2 options. One option is only kneading massage without heat. Another option is kneading massage with heat and rotating in different direction.So customer can choose massage to have heat or not to have heat. Allows multiple massage positions.